Preseason spring break trips are a crucial step in any high school lacrosse teamʼs successful season. Every year during spring break, hundreds of high school and college lacrosse teams travel to warmer locations within the United States such as Florida or South Carolina to train for the upcoming season and come together as a team. Student Cultural Exchangeʼs service-based spring break programs in Costa Rica are an exciting alternative to the standard Spring Break trip. The program allows American lacrosse players to experience an entirely new culture, to participate in important community service work in developing countries, and to spread the game of lacrosse internationally while maintaining a high-level training regime for the upcoming lacrosse season. 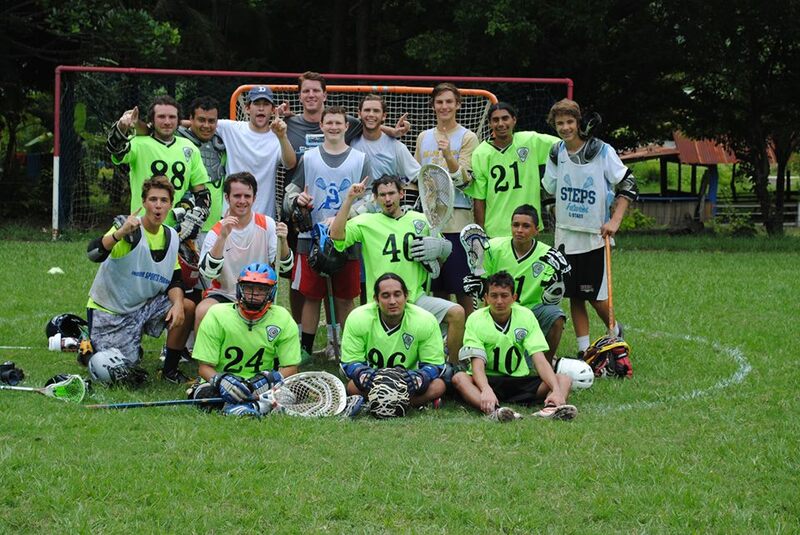 For the past several years, Student Cultural Exchange has been a pioneer in helping to spearhead the growth of lacrosse in Costa Rica through summer teen travel programs. The programs seek to grow lacrosse in new territories around the world and simultaneously help support local nonproﬁt organizations through ﬁnancial assistance and volunteer aid. The overriding goal is to use the game of lacrosse as a vehicle for change in the countries we visit, but also in the American lacrosse players who may be exposed to this sort of humanitarian work in developing countries for the ﬁrst time in their lives. Spring break training trips are a crucial period of time for serious lacrosse teams to develop their individual skills and team concepts. The Student Cultural Exchange spring break programs recognize the importance of these trips from a lacrosse development perspective and work to provide ample practice and game time and the opportunity to scrimmage new and unfamiliar competition at professional facilities. The actual practice and game time can be customized based on the individual coachʼs request for a lighter or heavier workload, or more time participating in community service activities. The Student Cultural Exchange staff make it a priority to meet the speciﬁc program goals and objectives for each individual coach and team. Community service in the local communities is an important component of the Student Cultural Exchange international preseason spring break programs. The speciﬁc service projects will be dependent on the year, location, and need for the community as determined by the CREAR nonproﬁt organization with whom our travelers collaborate during the course of their program. Some projects in the past and possibilities for the future include: teaching English in a local school, leading summer camp activities, environment beautiﬁcation projects such as beach clean-ups and tree planting, and many more similar projects. There are few experiences that bring a group of young people together like travel and immersion in a new, unfamiliar culture. Successful athletic programs across all sports and levels of competition understand the team-building value that international travel can bring to a group of teammates. The Student Cultural Exchange spring break programs are designed to push young lacrosse players outside of their respective comfort zones to grow together as a team before the start of their lacrosse season. Student Cultural Exchange works with coaching staffs to customize each trip to suit the needs of individual teams. The exact number of days, activities, volunteer projects, practices and scrimmages will be coordinated in conjunction with each teamʼs speciﬁc goals and objectives. Pre-season programs are generally 5-7 days in length and operate throughout late February and March. Teams stay in a variety of boutique hotels in Samara. All hotels are clean, well furnished with excellent security. Student Cultural Exchange has been operating immersion based programs in Samara for 13 years and definitely knows the best hotels to stay at! Food in Samara is awesome. For breakfast we have traditional American and Costa Rican breakfasts. For lunch we usually eat fresh, delicious, traditional Costa Rican food such as Casado’s or rice dishes or fresh seafood. For dinner we eat in a variety of restaurants in Samara or have bbq’s on the beach. You will absolutely love the food in Samara. Please let us know before the program of any specific dietary restrictions. Each day of the program is different so there is no such thing as an "average" day. Most days will include some of the following; lacrosse clinic, practice, scrimmage, volunteer project, conditioning runs on the beach, outdoor activity like surfing, zip-lining, etc.The days are packed but awesome! Definitely! The children of Samara and Carrillo love having donated lacrosse equipment to continue playing lacrosse after our groups leave. We ask that donations are made to SCE guides instead of giving equipment directly to individual students in schools we work with. Not at all. This program is designed so that students can fully take part in all experiences, regardless if they have ever studies Spanish. Having said that, if a student wishes to practice and improve their Spanish, there is ample opportunity for them to do so. How many practices and scrimmages does each team take part in? SCE works closely with coaches to customize each trip to meet the needs of the specific team. On average, teams practice and/or scrimmage everyday! Teams practice and scrimmage on the neighboring Carrillo field. A well kept soccer field (that is lined for lacrosse during SCE programs) the field is natural grass but well maintained. Teams love the opportunity to scrimmage and practice under the lights or during the day as townspoeple congregate to watch a new sport being played! Program tuition covers all transportation within Costa Rica, all lodging, 3 meals each day, volunteering fee's, activity fee's and field rentals. Not included int he program price is airfare, snacks, souvenirs and unexpected travel costs. Our Pre-Season Lacrosse and Service travelers engage in small-scale volunteer projects that are designed to make a meaningful impact for the community and environment of Samara. A small sample of past projects include planting tree’s, re-furbishing a playground, painting the community center and working to save sea-turtle populations along the pacific coast. There are no country specific vaccinations needed for travel to Costa Rica. Prior to the program we will email our medical form (included in the welcome packet), we simply ask that you and your parents fill out the form letting us know of any medical issues that we should be aware of. A valid passport that does not expire for at least 6 months after the program dates is the only travel documentation required. A visa is not needed for travel to Costa Rica.